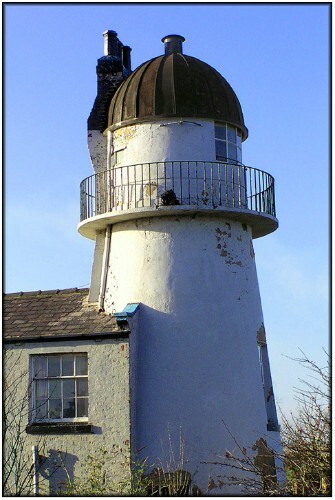 Killingholme is a somewhat obscure and rather out of the way location that has a remarkable collection of lighthouses. At one time, three lights were used, their alignments defining two separate and distinct ranges. The towers still exist today although only two of them are still active and only a single range is still defined. This is the inactive light - known as Killingholme North Low. It has been inactive since 1920 and is now a private dwelling house. To reach this place involves a fairly long drive along increasingly minor roads until you reach a spot on the river bank close to the light where you can park. As I climbed out of the car I spotted some warning signs that set my danger warning antennae quivering. The first thing was that the entire sight of the former lighthouse was completely surrounded by scrap cars in various states of decay and destruction. Now, it is my experience that scrap cars and often associated with large, hostile dogs, and the more scrap cars, the larger and more hostile the dog. Given the rising crescendo of barking that ensued as I approached I was pretty confident that the sensitivity of my antennae was not deteriorating with age. There appeared to be no boundary fence of any significance - at least nothing that looked capable of containing a dog that was evidently about the size and ferocity of an angry polar bear. In the end, I scuttled past with my eyes firmly fixed on the river bank intent on avoiding eye contact with whatever the "thing" was that was barking - my imagination told me that it probably had at least three heads and no doubt resembled "Fluffy" in the Harry Potter movies. I grabbed one rapid shot of the light as I passed and fortunately it turned out to be usable - however the rest of my pharology outing was somewhat blighted by the knowledge that I would have to run the gauntlet with "Fluffy" again in order to get back to my car. Apart from devil dogs waiting to rip your arm off, there are no real access problems (or at least there weren't during my visit in 2003). The light isn't all that bad either but, in photographic terms, the real problem is foreground clutter with about a zillion wrecked cars, trees, bushes, wires and all sorts of stuff. If, by now, you have formed the impression that I didn't like this spot much then you are dead right!